This Saturday saw the first champions of the 2015-16 season crowned, a 26-year Football League record broken and 16-year-old scoring on his debut for the same club as his father. Here are five things you may have missed from Saturday's action. James Vaughan, then of Everton, might hold the record for the youngest Premier League goalscorer, but it is Jason Dozzell who remains the youngest scorer in the history of English top-flight football, at 16 years and 57 days. The midfielder scored on his debut for Ipswich in 1984 and spent seven successful years at Portman Road before moving to Spurs, Northampton and Colchester. Thirty-two years later and Dozzell's son Andre netted for the same club on his debut, aged 16 years, 11 months and 15 days in the 1-1 draw with Sheffield Wednesday. Dozzell Jr had already reportedly been interesting the likes of Liverpool, Arsenal and Tottenham before his goal. Elsewhere, ex-Newcastle midfielder Rob Lee's son Olly scored for Luton at Oxford while Josh Windass, son of former Hull City striker Dean, netted his 13th and 14th of the season for Accrington against Morecambe. We've all got a cherished memory of watching an outfield player in goal, haven't we? Either there is no replacement on the bench or all the substitutions have already taken place and then some unfortunate soul has to give it a go between the sticks. That's what happened to MK Dons at Preston when they had their keeper Cody Cropper sent off nine minutes from time for a challenge inside the area on Eoin Doyle and striker Alex Revell donned the gloves. Revell, who has four goals this season, saved the resultant penalty from Joe Garner, and secured a point that ended a four-game losing run for his relegation-threatened side. Not only did he help his team to a draw, he can also now lay claim to a clean sheet in the Football League. When you drop out of the top four tiers of English football into non-league, it is more often than not a long, hard slog to get back among the top 92 clubs. 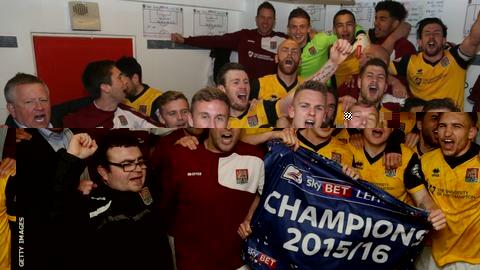 Not since 1990 had a team dropped out of the Football League and then won the title the next season to return - until now. Cheltenham Town's 2-0 win over Halifax confirmed them as the National League title winners and with it an immediate return to League Two. The Robins were relegated last season after 16 years in the Football League, but former Yeovil and Bristol City boss Gary Johnson has guided them back at the first attempt in his first full season his charge. Going the other way, Dagenham & Redbridge's nine-year stay in the Football League ended as they were beaten 3-2 at Leyton Orient, while Northampton were crowned champions of League Two after their 0-0 draw at Exeter. Peterborough United's Darragh MacAnthony is one of the most outspoken chairmen around. With his side in mid-table in League One, earlier this week he stated that each off the 300 people he employs, including the tea lady, were under threat of losing their job this summer. Having put huge sums of his own money into the Posh, MacAnthony spoke of his anger at their recent form, which included six defeats in seven games between February and March. When striker Scott Hogan moved to then newly promoted Championship side Brentford in the summer of 2014, he was at the peak of his powers having scored 19 goals the season before for Rochdale. Hogan's feel-good story had seen him released by Rochdale and rebuild his career in non-league football before rejoining the Dale and prospering at Spotland to earn his move to the Bees. However, after just two substitute appearances for his new side he suffered a season-ending knee injury and then a year later suffered the same fate on the same knee. After three comeback substitute appearances over the past month, Hogan scored his first Brentford goal in injury time to secure a 1-1 draw against Bristol City - 635 days after his move to Griffin Park - to earn a round of applause from his team-mates in the dressing room. All that after Hogan had an earlier penalty saved. A former team-mate of Hogan's, Will Grigg, meanwhile, scored his 16th goal in 17 games as Wigan lost 3-1 at Doncaster, a goalscoring spree that has sparked a new favourite terrace song for Latics fans. "Nah-nah-nah-nah-nah, nar-nah, nar-nah, nar-nah etc."